Alex Ovechkin’s latest spring postmortem might well have been his toughest yet. The 30-year-old has been the face of the Washington Capitals for over a decade, and the quickly-graying Russian welled up in Pittsburgh late Tuesday night after his team again fell short of the championship and accompanying long playoff run that this city will continue to wait for. “Every year, lots of expectations, lots of great players, something missing. 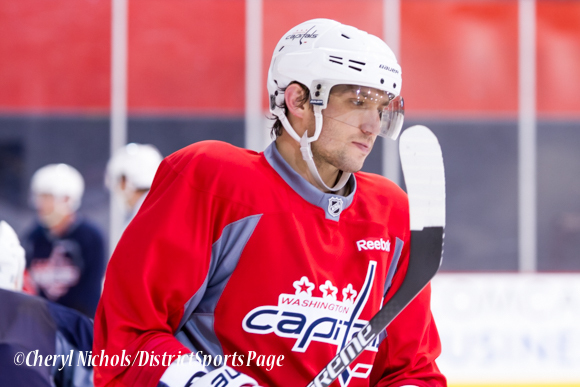 This group of guys can do better and bigger than just the second round,” Ovechkin said. This team had, by most accounts, the greatest regular season not only in the organization’s history, but the best that D.C. has seen in almost 25 years. A franchise-record 56 wins were backstopped by an average of just 2.35 goals allowed per game. The defensively proficient Capitals were more than serviceable on the other end as well, and it appeared that at long last, Washington would see its hockey club reach unprecedented heights and make its long-awaited first playoff run with their superstar captain. Valiant effort and all, the Capitals’ season ended with Nick Bonino’s overtime goal, kicking off another summer of retooling and questioning. This was, by most accounts, “supposed to be” the year for the Capitals. Four quality forward lines, three reliable defensive pairings, and a likely Vezina winner between the pipes in Braden Holtby were “supposed to be” the ultimate repellent of the demon that’s bore down on the Capitals’ shoulders since the days of Yvon Labre. Capitals general manager Brian MacLellan is to be commended for the work he’s done in his two years as the team’s top personnel man, as the acquisitions of T.J. Oshie, Justin Williams, Matt Niskanen, and Brooks Orpik have, on balance, panned out in a positive way. How do you improve a team that had 120 points and might have secured the most in league history if not for a late-season swoon preceded by a long break thanks to a historic blizzard right as the team was full stride? (side note — if there was a Caps fan that was going back-and-forth as to their belief in whether a higher being had it out for this franchise after that snowstorm, they sure as you-know-what might now). How do you look at this team, with a top line better than maybe any in the sport since the 2005 lockout and arguably the best goalie in the world, and pinpoint a specific fix? I’m not sure whether this is supposed to be more or less comforting, but in my mind, the answer isn’t exactly obvious. As of today, over $11 million in salary cap space is coming off the books this summer. Marcus Johansson and his $3.75 million cap hit will surely be the most-watched player as the weather warms up and he returns to restricted free agency after reaching a bridge deal with the team last year. His seven points in the postseason were a career high, and he has proven to be a solidly dependable middle-six forward. But will MacLellan choose to bring back a player who will not only carry a hefty price tag but also a potential third-line status yet again, after a one-point postseason performance from Andre Burakovsky that most will — accurately, in my mind — categorize as an aberration? With the development of 2014 first-round draft pick Jakub Vrana, it’s not a foregone conclusion that Johansson will be in Washington next year. 37-year-old Jason Chimera (pending unrestricted free agent) is the team’s elder statesman, and the longtime Capital had 20 goals and 20 assists this year. He may end up being almost as big of a question mark as Johansson, and it remains to be seen whether he will accept a reduction of his $2 million cap hit here or elsewhere. Dmitry Orlov, whose cap hit is the same as Chimera’s, saw his rapid growth stunted by a wrist injury sustained two years ago this month. With Niskanen, Orpik, Karl Alzner, John Carlson, Taylor Chorney, and Nate Schmidt still locked in for 2016-17, I think it’s perfectly justifiable if MacLellan decides to use the $2 million he would spend on a qualifying offer for Orlov elsewhere. Tom Wilson, Michael Latta, Mike Richards, and Mike Weber also see their contracts expire on June 30. Even if the salary cap increases to over $74 million, one or more of this group of pending free agents will likely not return. Although the team’s new look wouldn’t be nearly as stark as those of the last two years, it would be noticeable. MacLellan said last year that the Capitals are in a two-year window in which they believe they can compete for a Stanley Cup. After next year, the contracts of Oshie, Williams, Burakovsky, Alzner, Schmidt, and Evgeny Kuznetsov will expire. Then, Ovechkin will be 31. Father Time is, of course, undefeated, and although Ovechkin continues to score goals with about as much frequency as Metro performs unscheduled maintenance, he will not score 40 or 50 goals a season forever. It’s a sobering thought to say the least, but at 17 minutes past 11 p.m. at the Consol Energy Center on Tuesday night, a painful reality set in for those who follow this team that, until that time, had mostly been thought of yet seldom verbalized. There is a possibility that Alex Ovechkin does not win a Stanley Cup as a member of the Washington Capitals. The key pieces from this year’s team will all be back next year, and barring serious injuries, it’s easy to see Washington winning the Metropolitan Division again next year. Maybe another President’s Trophy is in the cards as well. But, to be blunt, that isn’t enough anymore. Some people old enough to legally drink have not been alive for a D.C. sports title — by a few years. There are people old enough to rent a car that do not remember Mark Rypien and Charles Mann and Kurt Gouveia. In a place known for monuments based on characters of history and the names that follow them, Washington can point to some that exist in the realm of athletics as well. Physically, there are no nods to the likes of Pete Kozma or Pat laFontaine or Derek Stepan or, now, Nick Bonino. But the scars are there. Capitals head coach Barry Trotz said earlier this week that the Capitals’ previous playoff failures are mainly a media-spun narrative and not based in hard facts. For all the talk this year coming from the Capitals’ dressing room of how it was unfair to judge this team based on the chokes and burnouts of the past, the 2015-16 edition of the Capitals have engraved their own excruciating mark into the legacy of D.C. sports, perhaps the most painful of the last decade. Next spring, whether in April, May, or June, the questions surrounding the core of this team as to whether they have what it takes to win a title will become answers. The framework for that stage will be set in the next couple of months. Until that time, we do know this: in eight playoff berths over the last nine seasons, the Capitals have failed to reach even one conference final. The final chapter to this group has not been written yet, but to this point, it’s safe to wonder if they truly do have what it takes to get over that final hump. Eric Hobeck is a Staff Writer for District Sports Page covering the Redskins and Capitals. Eric contributes to high school sports coverage at InsideNova.com. He served as sports editor of The Rotunda at Longwood University for two years, where he was also the men’s basketball beat writer. He hosted a campus radio show for three years and called basketball and baseball games for the station’s award-winning sports team. You can follow Eric on Twitter @eric_hobeck.